There's two minor points to note about this video, and one major point. At the start of the video, the cameraman describes the weapon as a "Volcano rocket". As I noted earlier this week, the "Volcano rocket" is a named used for both this weapon, and smaller IRAM-type weapons used by government forces. It seems now, we finally have a name for this weapon. Those are both minor points, but what's extremely unique and important about this video is it shows the impact of the rocket followed by the sound of the explosion. The detonation is at around 17.5s, and the noise of the explosion can be heard around 23.5s, so that's a delay of around 6 seconds. The speed of sound at around the altitude is around 337 m/s, so that would mean the range of the munition is around 2022 meters. While the impact isn't visible, it appears the flight time is around 20-22 seconds, several seconds longer than the other video. Richard Lloyd believes that the longer flight time would point to a higher angle of launch, and a longer range. Based off the two videos Richard Lloyd believes a range of 2-2.5km is reasonable for the Volcano rocket. That's not to say the maximum range is definitely 2.5km, just that based of available evidence that's a reasonable estimation. After the August 21st attack Storyful collected data on various claims about the impact locations of rockets used in the attack, including the claims by the local LCCs about the impact locations of each rocket. All the positions were plotted onto a map, with the impact locations reported by the LCC marked in light blue. According to that map, all the impact locations are within 2.5km of the area controlled by the Syrian army. So from all this information we can conclude that the Syrian military would have been capable of launching the August 21st Sarin attack, despite the short range of the Volcano rockets. Splash is at 17.9 seconds (video editor timing) not your 17.5 seconds. Extrapolation of flight time to range at extreme range is not valid, especially with a very non-aerodynamic warhead. Basically the longer it's in the air the more it slows and drops. Flight time to range is only valid for ranges significantly less than maximum when the relationship is more linear. This is published information for conventional rocket artillery - which your expert should have available. Elevation angle of launcher 21 degrees?! I think you need to have another go, not that it's really important in these particular range calculations. Azimuths from Al-Jazeera?! Their video is riddled with inaccuracies. Just about every technical measurement they could get wrong they did. For instance they concluded the missiles were fired from the Hills behind the Presidential Palace - many kilometres from Zamalka. They are quite simply not a reliable source. They are a sensation seeking TV station with a political agenda. That's all. It provides evidence and photographs for valid azimuth calculations. Their azimuth summary is that the missiles came substantially from the North, not North-West. SAA use of bus-station and armoured vehicle compound? Many videos show those places under continual mortar attack and infantry attack. They would be the last place anyone would want to position CW units where they could be damaged or captured - both being major risks for the crews. You're right about the speed of sound, I used the sea level number, I'll update that later. As for AJA, I'm sure you'd agree it's possible for their range calculations to be wrong, even if the azimuths are correct. The armoured vehicle compound and the bus-station are just about the only places on 6th Tishreen that you could *guarantee* that there were hostile eyes watching with malice in their hearts and heavy weapons in their hands. Not exactly a good place to park your un-armoured small trucks and spend significant amounts of time loading and firing them. You'd think after 3 months of fighting there they'd have a pretty good idea where the safe spots were, and that could be one reason they did it at 2am. That probably reads as more snarky then I intended, apologies if it does, on my mobile. ... otherwise they'd be in the unfortunate position of being in small-arms and mortar range of a whole bunch of hostiles who would be cued in by the incredibly loud sound of the rocket motors and the 12x brilliant 3 second glare pointing back precisely to their launch position. And not only that, the hostiles didn't shoot at them nor report on twitter and facebook that they'd seen rockets fired from the base at the exact time the gas attack occurred. There were plenty of missile launch reports and videos on 21 August. I remember one near Baghdad Bridge, and at least one video. However none came from the region of 6th Tishreen and possible SAA strong-points. I guess your 2am theory must be right. The insurgents were all in bed dreaming of their 72 virgins. Brown Moses' article is, as always, well structured and laid out. He does take time in putting together reports. That said,he always seems to start every investigation on the 21st August attacks from a "it was the government" position and this is very heavily reflected in the bias one picks up from his articles. He starts from a predetermined conclusion and then sets out to make the evidence fit. That is not to say he is wrong but as Charles (above) points out there are a few inaccuracies and improbabilities that Eliot looks over and I don't believe he does so in purpose. I believe it is more to do with him being blind to them due to his bias and I say that in the nicest possible terms. 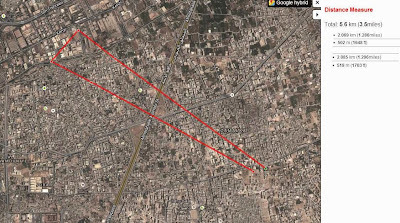 As I noted over on WhoGhouta blog firing these missiles from a contested area to a contested area is a matter that BM overlooks. 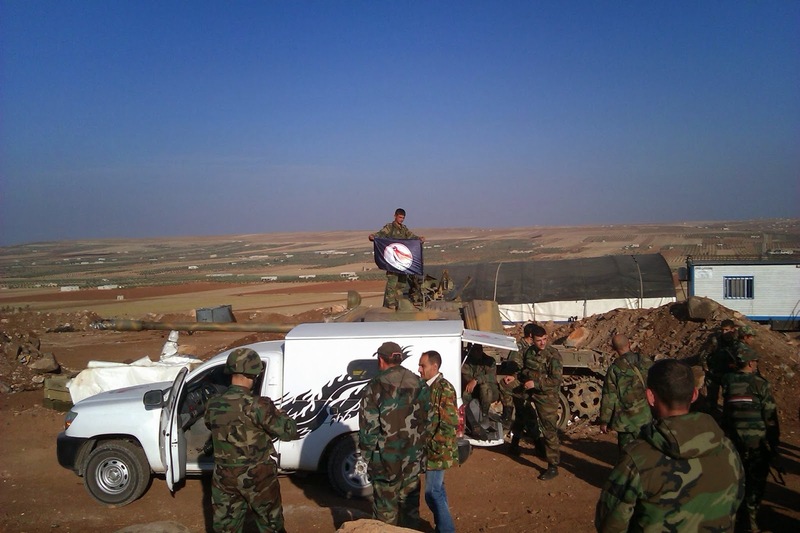 For him the flag is that of the NDF and the rockets are being fired from a government position to a rebel position. Yet the issue of whose flag that is is heavily debated on social media and the area this "volcano" was fired from is in contested area and the intended target also in contested area. He concludes that it is possible that the government fired the volcanos containing Sarin from a hotly contested area with no one seeing them being fired, hearing them being fired or without their location being given way and thus attracting possible motor fire from very near by rebels. In essence BM has, in my opinion, simply built a straw man argument with a lot of if, ands and buts, possibly and maybes. I still remain unconvinced by his arguments and feel this article offers little in way in evidence of guilt on either side. I think more could be determined by Eliot if he would approach this debate with an open mind, no matter how convinced he is that the government did it. For the reality is that the only thing he has in favour or his theory is that rebels have not been seen firing volcanos or in possession of them..yet. I would be very interested in ascertaining whose flag that is on the launcher first! But take that away and he has no argument. So therefore if he would put his obvious intelligence and analytical skills to good use by starting from a position of "anyone could have done this" (which is the truth) then he would get much closer, much sooner to finding some real evidence I think. In closing if any of my points raised come across as cheeky then I ask in advance to be forgiven as this was not my intentions but just how I word things. As far as I can see, the joint OPCW-UN chemical weapons team didn't request the Syrian govt to surrender or account for, the 'home-made' weapons discussed on this blog. Their work was made difficult because some of the chemical weapons infrastructure was not within areas of govt. control or was battle damaged. @Jim Dobbins: in the picture with the flag you can see one of the soldiers is sporting the regime flag on his cammo (to the right) so they are definately not rebels. @Stephen Moss; Thanks for that Stephen though I was referring to the video of the Qadam launch at the top. I don't doubt the picture you refer to is the NDF and/or the SAA. Maybe didn't make that clear in my post. Still trying to get used to writing posts on these platforms as I have always been an avid onlooker only! The video I refer to could very well be a SAA/NDF launch, I accept that. But I like to see evidence of things before I rule on them and whilst Eliot believes the flag to be that of the NDF (and it very well could be) I don't believe that assumption can be made by viewing the flag on the launcher. Could be showing my naivety here but here goes; I've been watching loads of videos of the Syrian affair for the last few years but especially the last few months and unless I am not thinking with clarity I cannot recall seeing the NDF place a flag on launchers/trucks etc before. Can anyone confirm if they have? Eliot is it possible if you get the time if you could address the points that Charles raises above? Considering your article is continuing the investigation into the Ghouta attacks it does appear that you haven't taken his points into consideration? ... otherwise they'd be in the unfortunate position of being in small-arms and mortar range of a whole bunch of hostiles who would be cued in by the incredibly loud sound of the rocket motors and the 12x brilliant 3 second glare pointing back precisely to their launch position. And not only that, the hostiles didn't shoot at them nor report on twitter and facebook that they'd seen rockets fired from the base at the exact time the gas attack occurred." It's clear from the ANNA videos that the Syrian army were attacking the regions next to the area marked, so it's not like we're talking about a situation where you have the area then control, the main road, and hordes of opposition fighters waiting to attack, these areas had been hit pretty hard by the looks of the videos. The videos also show Syrian military vehicle parked in that area, seemingly unharmed by the barrage of mortars Charles envisions, and it's pretty obvious the Volcano can be used for indirect fire, so to assume they'd be parked out in the open without any buildings between them and the enemy seems a little silly to me. There also seems to be the assumption there was only one launcher, firing all the munitions, when it's just as (if not more) likely there was more than one launcher. That's a couple of hundreds meters from the area to the south that's not marked as under government control. It's broad daylight, and they are making plenty of noise, especially with all those armoured vehicles driving around, but do they encounter barrages of mortar or rocket fire on their position? Not by the looks of it, and that was filmed 2 and a half weeks before the attack, with plenty of government activity securing that area in that time. We have seen from various footage that the loading of the Volcanos is quiet a long and difficult task and as we see by the video footage from ANNA that whilst the SAA were fighting in the area so were the rebels. We also see that that the armoured vehicles were not stationary for too long and that troops found it difficult to actually get across the street. So how do you think the SAA managed to go through the laborious task of loading and firing these Volcanos from a stationary position in such a contested area, especially given the time, effort, manpower and noise that would be needed to do so. And that in an area that even troops find it difficult to move in? And all this without the opposition lodging a single report of seeing such rockets fired from the area? For contextual reasons here is a video of a Volcano being loaded which you yourself posted on the blog a while ago I believe. We can see the difficulties faced by the SAA in moving infantry a short distance. So my question is; how do you assume the SAA managed to follow the procedure in loading the Volcanos onto their launchers on the back of trucks in an area infantry are highly at risk in? If you map out the videos you'll see that by later in August they are operating quite freely in the majority of that area. The plan was to push into that area, then use it as a staging area to encircle the areas to the north and south, and it seems that by August 20th they had accomplished that. There's videos of them attacking northwards from the quite deep into that area, so it seems to me they wouldn't be doing that if everything behind them was full of opposition fighters. If I have time I might watch all the related videos and map them out, try to get a clear picture of everything that was happening there. I did a lot of work geolocating them, but its very time consuming to do them all, although doable. Regarding that video, it's from August 4th, and later videos show them fighting further east of that position, and to the north, with the area west appearing to be pretty secure. Again, reviewing and geolocating all the ANNA videos from that time would clarify things further. I have spent some time in trying to work out who controls/controlled what in that area at that time and my conclusion is that it was contested with very little movement on either side. But I am open to correction on that. But that still doesn't explain how the SAA would be able to load and fire multiple Volcanos from the area, which even today sees fighting, without a single rebel report of seeing these very unmissable rockets fired. And there's no better man than yourself to be aware that the rebels are forever videoing everything so it seems pretty unusual that they would fail to video these launches or at the very least report them. Why do you propose that is? "A doctor working in the medical center in Erbeen, a town in Eastern Ghouta, told Human Rights Watch that the attack there began at 3 a.m. on August 21. He said that at the time there was no fighting taking place between government forces and opposition fighters. Activists in the area told him that 18 missiles, carrying what they said was a chemical agent, fired from the direction of the October War Panorama, a military museum in Damascus city, and of Mezzeh military airport, hit Zamalka, Ayn Tarma, Douma, and Moadamiya." The October War Panorama is about 1km west of that area, so could it be possible the witness was slightly out with the point of origin? "A media activist in the town of Ayn Tarma told Human Rights Watch that the attack there began between 2:30 and 3 a.m. He said that around 2:30 a.m., he and others saw a missile launched from the direction of the October War Panorama in Damascus city. At the time, he said, he was at home with friends. He described what he thought was a surface-to-surface missile striking nearby and releasing a chemical substance:"
If you check the map, the area just in front of the October War Panorama, between it and Ayn Tarma, is the area controlled by the government. Thanks for all your time on this Eliot. Right now you are going to think that I am deliberately being awkward but please note that is not my intentions. But take an objective look at that statement for a minute. "A media activist" who "thought [it] was a surface-to-surface missile...[that released] a chemical substance"
So HRW's source of this information is a rebel but not even a rebel fighter (who may have known it could have been a surface-to-surface rocket) but a rebel media activist. A media activist who knew what was and wasn't a "chemical substance". I just have a difficulty with accepting that single source as proof Eliot. Let alone HRW which has already been found to be misrepresenting facts in relation to the 21/8 attacks. Let me put it this way; say the shoe was on the other foot and this was a government "activist" trying to implicate the rebels, would you lend his/her statement much validity under the circumstances? On the doctor's report. Again afford the story some objectivity. Why would rebels tell a doctor specifics such as the time of the attacks, that "18 missiles" were fire, that they were "carrying...chemical agents" and that they were fired from a particular area to particular areas? Does a doctor need to know all that? Again the source is HRW. Now that isn't to rubbish these stories entirely. This guy/girl could quite easily be telling the truth as could the doctor and if so this deserves a second look. Have you uncovered any additional witness testimony or reports to support what they say? You also suggest that whilst the "October War Panorama" is 1km away from the suggested launch area that the "witness (a rebel) was slightly out with the point of origin"? 1km is a big distance to mistake when trying to locate were up to 18 rockets were fired from. Especially when one is being very specific about all the details. But let me look into this some more before ruling it out and if you come across any other information I'd really appreciate it if you could post it in reply to this thread? One thing to consider, they might be saying the October War Panorama because it's the major landmark in that area, and if the witnesses are in Ayn Tarma, a few km away, and the attack was at night, how accurate can we expect their estimations to be? It's also worth noting these statements are from HRW's report on the day of the attack, way before the talk of azimuths and ranges. "One thing to consider, they might be saying the October War Panorama because it's the major landmark in that area.." Yeah I can buy that alright. Makes sense to pick a landmark as it would be unlikely they could name a street from a distance. But 1km is still a huge discrepancy Eliot especially when this rebel was quite specific to, of all people, a doctor. Pick a landmark in your location, now how could mistake something coming from the direction of the landmark that was actually 1km west of it? That theory seems quite far fetched to be honest. I can understand maybe getting the distance wrong but not being 1km out in my estimation of where something came from. "and if the witnesses are in Ayn Tarma, a few km away, and the attack was at night, how accurate can we expect their estimations to be?" I agree. So how are they able to be so specific? And why tell all this to a doctor? 1km is a large distance Eliot in this argument. "It's also worth noting these statements are from HRW's report on the day of the attack, way before the talk of azimuths and ranges." That would be my understanding of this too. Yet at 3am this rebel just happened to be awake and was able to see 18 rockets being fired from a specific location (that was actually 1km west from where he originally said) and he was able to suspect "chemical materials" being used and he decided to go and tell a doctor about all this? It doesn't make sense to me. Now I will take this opportunity to say that my line of questioning is not that I am trying to say that the SAA didn't do it and the rebels did or vice versa. But that I am merely questioning the points you raise. But if the rebels did carry out the attacks it wouldn't be a big stretch to assume that they would say they seen the rockets being launched from a government location. This "media" rebel would be who they would likely roll out without a scripted response to HRW or whoever. I of course have no evidence to support that but it makes more sense than to believe that a rebel who seen everything decided he would tell the doctor at the hospital and be very specific about things only to turn out to have misjudged the launch position by 1 km to the west. I hope you can see my argument and again don't think that I am being flippant at all. Consider also that these people might just be telling HRW what they've heard, rather than personally witnessed. Absolutely Eliot. But does that make it better or worse? As we all know the reliability of third or fourth hand information. A correction to what I said above: "This "media" rebel would be who they would likely roll out without a scripted response to HRW or whoever.." should read "with a scripted response". As I said previous Eliot I believe your intentions are honourable in this and I truly believe that you are convinced the government carried out these attacks. But what I see happening is that you then set about trying to make the facts your conclusions and this results in you then speculating quite a bit at times in order to make the evidence fit the crime. Again I don't think this is malicious on your part but an honest belief in what you're doing. Know what? You could be very well correct and maybe one day your hunches will prove to be correct and if that day comes I will be in line to congratulate you. But...isn't there always one when someone throws graces at you? It is also possible that the rebels also carried out this attack. And to be truthful I think the odds of that being the case have rises dramatically through investigations such as yours and Who Ghouta's. On the 21st August I was 99% it was the government that did it. Today I am honestly 49/50 that it was the rebels though I admit that I have added some speculation into the mix to reach that figure but I cannot see anything pointing to the government doing it. Not a shred of evidence as come to light but just, for its part, more speculation and theories. You know that nagging feeling that you get that just won't go away? The real strong feeling that keeps you awake at nights? That for me is the Liwa Al Islam Videos. Yes I have taken onboard the various issues people have with them with my biggest personal hurdle being the flags draped everywhere but what if they are legit I keep asking myself? What if? 1) These are the smoking gun videos; Liwa al Islam did it! 2) The videos are a hoax." It's as simple as that for me. If they are the real deal then we have been ignoring something right under our noses the whole time. If not then, everyone as they were - as the saying goes. Let's assume that Liwa Al-Islam did it and that those videos prove it. The objective would be to trigger foreign intervention, Obamas red line and a no-fly zone. This would require a highly covert operation. Do you find it reasonable that they would then proceed to film themselves dressed up in a way that screams "We are Liwa Al-Islam and here we are proudly shooting gigantic chemical rockets at our own people"? Whilst wearing gas masks, t-shirts and muttering unconvincing takbeers.. Did you notice that the camera operator did not wear a mask, by the way? 1. It was an improvised documentation of the actual event, made by one of the militants and meant exclusively for internal sharing within Lawa al Islam. 2. Its a bona fide Lawa al Islam-propaganda film, depicting the actual firing of chemical weapons on Ghouta. The reason it was never published is because it all went terribly wrong. Instead of killing Assad-forces, huge numbers of civilians were killed. The videos could depict Liwa Al-Islam in a propaganda manner for their sponsors. I have read on a few separate occasions how outside players pay certain rebel groups to execute a particular action and they demand that video evidence be supplied to prove the job was done. "At least 85 per cent of the fighting groups he used to know have started smuggling oil and cars, he said. Many had also turned to exploiting the finances of sponsors funding the war against Assad. Rebel groups film their military operations and post the videos on YouTube for foreign donors to peruse. Each outfit has a unit of “journalists”, men who follow them into battle armed with a video camera. Back in the office they edit the footage, often putting it to music and stamping it with the group’s logo, before posting it online or sending it to their sponsor as evidence that the military operation they paid for had been carried out." So we know that outside funders do request specific actions to be taken and require video evidence said actions have been carried out. So what if this was the reason the video isn't of the best quality? What if the point of the operation was to launch these rockets into rebel held territory in a false flag operation that only a certain unit of Liwa Al-Islam was aware of? So as to cross Obama's red line whilst and to keep things low key in terms of how knew about the operation? This would explain why the majority of rebels may not have known about the operation and obviously blame the government for carrying it out? These are questions that I keep asking myself. And I will admit that this scenario makes a lot more sense to me than many of the other scenarios out there. I haven't concluded my own personal investigations as yet but these videos ned revisited again. "They Saudis are in the process of funding them with millions of dollars. My point is that the real Liwa Al Islam does not fit the profile of a group seeking sponsors on Youtube." I think you purposely misconstrued my point or didn't grasp it Amund. I didn't say that I believed the video to be meant for Youtube. Nor did I say that I believed the video was meant to try and get them sponsors from Youtube. That is ridiculous and a unfair representation of my argument. The videos could have been meant to be forwarded to their wealthy funders to prove an a given action had been carried out as requested and not for public consumption. "They were the biggest, best organized (and funded) group in Damascus." One must wonder why it is then that they are the biggest, best organised and funded group in Damascus which, incidentally, is the location of the Chemical weapons attack? And why it is that a video surfaced claiming to show this particular group launching the deadly rockets on the night in question and not one of the other groups? It was not my intention to miscontrue your point, I think we just have different interpretations of the Liwa-videos and their murky context. You argue that the videos may have been meant as evidence for an accomplished mission. Maybe I've seen to many movies, but: I don't think whoever ordered the CW-attacks would much desire a video of the perpetrators in action as "proof". "Maybe I've seen to many movies, but: I don't think whoever ordered the CW-attacks would much desire a video of the perpetrators in action as "proof"." "before posting it online or sending it to their sponsor as evidence that the military operation they paid for had been carried out." Maybe it was to prove that it was they that carried out the attack? That theory could be supported by the fact that Liwa al-Islam are wearing their Sunday best. Is it really far-fetched to believe that someone would ask for a recording of an incident that they paid for that would have probably resulted in a regional war had the US attacked? I don't think it is considering that we already know that rebel "donors" request video evidence of much smaller incidents that their money paid for. That is just one theory. The crux of Eliot's argument of regime culpability is that the rebels have not been seen in possession of volcanos or their launchers; that there is no video evidence ever showing rebels with them. Yet here we have several videos claiming to show just that and claiming to show the launch of the fatal attacks of 21/8. Yet they are brushed aside in favour of a theory the regime did it based on less evidence and requiring the reader to partake in mental gymnastics in order to make square pegs fit into round holes for that theory to hold water. The more I look at the "official" version of events the more it falls apart. It seems nothing more than a straw man theory. The Liwa videos could be fakes but if they are they went to extreme lengths to make them look like anything but professional videos and the fact they were found/released long after the threat of US attacks was avoided defies any logical reasons why they were even faked in the first place. What are the implications of this reduced range to West Ghouta attack? HRW tried to prove that both attacks came from the same army site. It looks to me that West Ghouta attack weth chemical weapons is dubious. 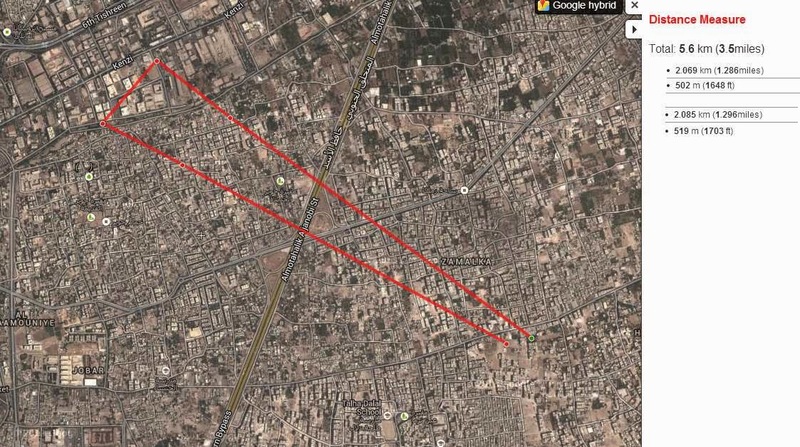 The West Ghouta site was a different type of (much smaller) missile with a much longer range which could have been fired from Mezzeh airbase or further back in the hills. However there is serious doubt there was even a CW attack in West Ghouta. Only one spent round was observed and a second was referred to but not documented. More plausible options include an obsolete spent round being placed prior to the UN inspection - evidence tampering being noted by the UN inspectors. Thanks Charles. My thoughts exactly. Himi > What are the implications of this reduced range to West Ghouta attack? HRW tried to prove that both attacks came from the same army site. You're smart and you have a good memory - it is the greatest threat to democracy. After three months of constant repetition about a small radius of flight "Eskimo 130/360" Human Rights Watch, the UN and other officials had to first of all admit that deceived the whole world. Nothing similar has not yet seen or heard, unfortunately. Even Moses von Broun continues to show blatant nonsense again: lie, lie, lie. 2 kilometers maximum range - is it hard to remember?! Re The Flag, it's unclear to me, but also could be that of the Syrian Social Nationalist Party (SSNP) who are fighting under the larger Hezbollah umbrella. This is a bit off topic but could you investigate the bomb trucks that anti-assad forces have captured, i have found around 3 videos with the same kind of design. The lower part of the truck has been cut up and replaced with a metal casing filled with explosives to make the top look empty. It's very like the installations used to smuggle cannabis (or more commonly, counterfeit tobacco) into the UK on car and truck ferries from the continent. One of the blocks of TNT seen is a bit over 2" thick, so I think they could get hundreds of pounds of TNT into this kind of installation, evenly spread over the underneath of the cargo bed so that it wouldn't load the suspension down in a way that would alert guards. Given the way in which truck bombing has spread, from Iraq to Syria and now into Lebanon, it may be off topic for this post but it's fair enough to put a link into comments so everyone can see how truck bombs are evolving, because they are the means by which this conflict is being spread into hitherto peaceful areas. From Algeria to Columbia, terrorists and drug smugglers often turn out to be the same people. I was more thinking of how these bombs have been used to stage suicide bombings blamed on the opposition. The first bomb that appeared was dubbed false propaganda but now 2 more have been sighted. And if i was a rebel i wouldnt waste money doing these bombs if people dont believe me. Also the colors on the flag use the regime colors. Could you put a north arrow on your map? I'm going to assume that north is toward the top of the image. It would also be useful if you could provide an inset or something similar to indicate location. Finally, could you explain exactly what each of the lines on your map refer to. Again, I'm going to assume they are the trajectories of the rockets. Otherwise, good work. Charles, did you leave the military because of eyesight issues? Because that's clearly not an UMLACA, just like the last one you spotted. I forgot to mention it's a gas warhead. Notice the gas cloud released on impact. And no my eyesight is not impaired. I'm using this blog's standards for labelling rocket powered missiles with enlarged warheads as UMLACA. Missiles with 107mm motors, 122mm motors, and 220/240mm motors have all been labelled UMLACA here at one time or another. I've never called IRAMs anything other than IRAMs, I think you must be thinking of another blog, maybe you can go post there about it. "Here we have the UMLACA in the launch tube, and you can just make out the black numbering that's common to the explosive type of these munitions, along with the single hole on the rear of the warhead." I could find the 107mm UMLACA references as well if I could be bothered. No you couldn't, any time I've used the term UMLACA it's referred very specifically to the explosive and chemical versions of the munition linked to the August 21st attack. I'm not sure how you expect me to take your opinions seriously if you keep asserting stuff like this that's not at all true, especially when it's stuff I've written. Referring to an image of the 220/240mm enlarged warhead rocket? I'm reporting what shows up on my web browser. The reporting is true. That picture shows what appears to be the explosive type of the UMLACA, which I've been referring to as UMLACAs consistently. UMLACA refers to a very specific design, and I don't see how any reasonable person could say it shares that design with the video you posted. That picture shows the very much larger 220/240mm missile that shares the same general body shape as the missile you dub the UMLACA. The SLUFAE also shares that body type. The difference between the 'UMLACA' and the large rocket shown is massive. It carries around 500kg of HE. It uses a 220 or 240mm motor. In comparison the 'UMLACA' has a 122mm motor and a vastly reduced payload. Dimensionally the large rocket is around twice the size in every dimension and may times the weight. There has never been any suggestion the large missile has been used for Chemical Weapons, yet you persist in calling it an UMLACA - "Unidentified Missile Linked to Alleged Chemical Attacks". What link to Chemical attacks? Where? It seems to me you labelled it an UMLACA because it has a similar body form and appears to be used by the SAA/NDF. Not because there is any evidence it ever has been used for CW or potentially will be. First of all, that still doesn't explain why you called the munition in the video you posted an UMLACA? I could see why you would use a term like IRAM for that munition, but I've established UMLACA as a term for a family of munitions. Now the term used by the Syrian government forces and Hezbollah appears to have been established as Volcano, I don't think there's any reason to continue using the term "UMLACA". The term UMLACA originated at the time I was unaware of an explosive type, had I had know that I would have use the term UMFLACA (unidentified munition family linked to alleged chemical attacks), or something else, but at that point I assumed everyone would be intelligent enough to understand there were different types of these munitions, especially when I repeatedly wrote and spoke about explosive and chemical versions of the munition. I don't know if you could even call them a family. The 122mm enlarged warhead missiles have different motors and ballistics depending on whether they are a HE or a WP/FAE/CW variant. The 220/240mm missile is different again. It's effectively a completely different design but uses a similar body form. Then there are the extremely different 107mm enlarged warhead missiles which are spin stabilised rather than fin stabilised like the larger variants. Even these come in at least two variants. To lump all these as UMLACA is wrong. To lump them as UMFLACA is almost as wrong. The reason I called the insurgent bottle rockect a UMLACA was simply to get your attention to your faulty general usage. I think I succeeded. Plus you now have the opportunity to write a blog piece on insurgent IRAMS. Insted of argueing if BM called it a UMLACA or not lets focus on you being a shill, that was clearly a Hell Cannon launching a homemade rocket as you notice the bad thrust and the white smoke trail. Not to mention the flight lengt of just a couple hundred meters. The smoke that appears when the tocket lands could just aswell be the thruster burning out in white smoke because the warhead failed to detonate. I'd suggest you look up Socratic Irony but I'm guessing it won't be a success. Charles, please leave your point scoring to another forum, I'm hoping for intelligent discussions in these comments, not internet point scoring. Eliot, I am wondering if you have ever came across the NDF using a launcher or truck with their flag on it before? Thanks for that Eliot. That was one of the sites I have been visiting. What I was looking for more though was the NDF flag on Volcano launchers or loading trucks? Is there any actual evidence that the NDF has used Volcanos? It isn't a major issue just more out of curiosity. Thanks again. The problem I have with some of the NDF videos is that they have a lot of SAA stuff in there so I find it hard to differentiate. I don't think their videos are specifically just of their own actions which has lead me to this line of questioning. In that video on your blog apparently of the NDF launching the rockets - is there anything in particular about that video that leads you to believe that it is the NDF firing them and not the SAA, such as dress code or the likes? Well, on the post I say it was posted on a NDF Facebook page, rather than saying they were the ones launching it. I'd expect the NDF and Army work closely, so it wouldn't surprise me if they were both in that video. Sorry what confused me was that when I asked you had you seen any evidence that the NDF has fired Volcanos and you pointed me to the video on your blog I assumed you were implying the video showed the NDF firing them. But apologies for any misunderstanding. I agree that the NDF and SAA would work very closely together. But I have yet to see any actual evidence of the NDF being in charge of a Volcano & launcher let alone firing one. Because I haven't seen any such evidence in the past makes me question even more the video you present above wherein you claim the blurred flag on the launcher truck is that of the NDF. To ignore that point is to suggest that the above video is actually the very first time the NDF have placed a flag on a launcher truck and this is the first video yet of an NDF launch of a Volcano (AKA UMLACA). "I guess your 2am theory must be right. The insurgents were all in bed dreaming of their 72 virgins." This is a very callus attitude towards a major war crime that killed 1400 people, a third of them children, no matter who committed it. Have you seen the pictures of those dead children? This statement speaks volumes about your concern for the Syrian people. "I would be very interested in ascertaining whose flag that is on the launcher first!" "False Flag" is not just a metaphor. Do you really think if you ID the flag on the vehicle, that is definitive proof of anything. "starting from a position of "anyone could have done this" (which is the truth) then he would get much closer, much sooner to finding some real evidence I think." My understanding is that the Assad forces has been bombarding Ghouta for months before the 21 August attack with "conventional" weapons [precisely the type that have killed 148,000 of the 150,000] and that they resumed this conventional bombardment right after 21 August, even before allowing the UN inspectors in. Since then they have had the district under siege and are attempting starve the people into submission. That is why someone might "jump" to the conclusion that Assad did it. It is the same logic that allowed people to "jump" to the conclusion and any specific air attack on London during the Battle of Britain came from Germany or that any village in Vietnam bombed during the American War was bombed by the Americans or their allies. By the same logic, whenever riders in white sheets lynched a black man in the South, many "jumped" to the conclusion that it was the KKK. Of course, thanks to freedom of speech, Klan supporters are always free to argue that those were black men dress as the KKK and lynching one of their own in the hopes of getting the FBI to do something. After all, they were wearing sheets so who can be sure? Is it the the view of WhoGhouta [a cavalier name for a mass murder] that all these attacks were false flag attacks done by the opposition to itself and than now they have themselves under siege? Or is it that some of the attacks were false flag and other weren't? Or that only the sarin attack was a false flag and the Assad regime is responsible for all the other carnage in Ghouta? Also, if you agree that the regime has carried out the vast majority of rocket attacks on Ghouta and the current siege, why do you think the rebels were better positioned to stop the poison gas attacks than these or break the siege? You demonstrate precisely why false-flags work so well. On the Polish border in 1939 everyone *knew* that Poles had crossed the border and attacked an innocent radio station to broadcast propaganda and foment an uprising against loyal Germans. They *knew* so well that the entire nation accepted the sad but necessary task of the Wehrmacht to enter Poland and stop these awful people. In fact it wasn't till years later that the truth came out. Right now you *know* that it was the Syrian Government who did this. Good luck to you. ""False Flag" is not just a metaphor. Do you really think if you ID the flag on the vehicle, that is definitive proof of anything. " My argument is that Eliot has concluded that that flag is the flag of the NDF and therefore this is an NDF launch based on that assertion. I don't believe the flag is clear enough to determine whose it is. But what if it wasn't the NDF's? At the very least it opens up another argument surely? "and that they resumed this conventional bombardment right after 21 August, even before allowing the UN inspectors in"
It's amazing how propaganda forms opinions within people and how this propaganda can, unquestionably, be passed on as facts. Assad hadn't prevented the inspectors from going into the area, as per the US' claims, but rather the UN delayed this themselves citing "security issues". Charles, you're now lying about my work, I don't want you post on this blog anymore if you are going to post lies. 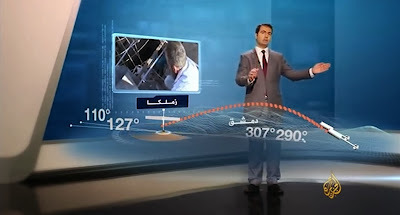 My work with HRW had nothing to do with the range of the munition, just the design. Charles, you don't get it, you don't get to post here anymore, all you're interested in is making false claims about my work and scoring points in internet arguments. Calcaneal fracture in India are one of the commonest fractures of foot. Dedicated foot and ankle clinic located in New Delhi. "The National Defence Force using the Volcano rocket for the first time in Syria"
I've seen this uploaded by Sham Times with the same title, which is a Government sponsored website. A bunion or hallux valgus Surgery in india is a swelling on the inner border of the foot affecting the base of big toe. Here's the thing: in your range graphic, you're using azimuths of roughly 295 and 307 degrees, but only one of the 3 azimuths you're using falls in that fan. Using the UN figure would create a much broader but less plausible fan.